In our office, this Christmas Cactus (Schlumbergera buckleyi) is one cheerful plant! It gets cool temperatures at night (55°F) thanks to our programmable thermostat and received 12-14 hours of darkness per night during the last month. Both conditions encourage blossoms. It has rich, well-drained soil and gets frequent misting. 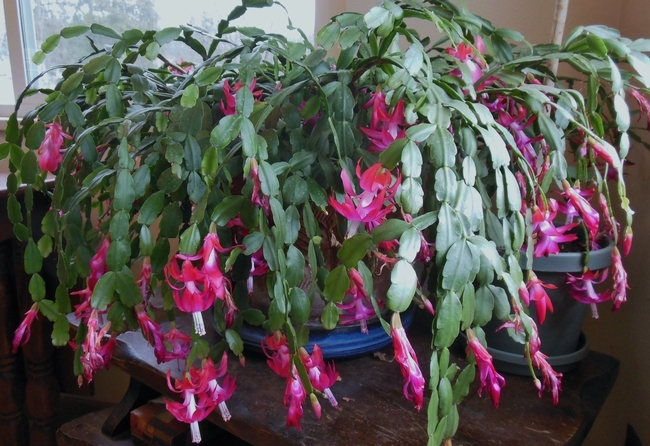 After it finishes blooming, the Master Gardeners pinch off the leaf segments to easily root and propagate new plants for gift-giving during the next holiday season.